Actually it was more like 1,920 if you count just the minutes we were awake on our very short layover in the U.A.E. We visited Abu Dhabi and Dubai. The country has lots of sand! Our main focus in Dubai was the Burj Khalifa, a tall building — quite an understatement! 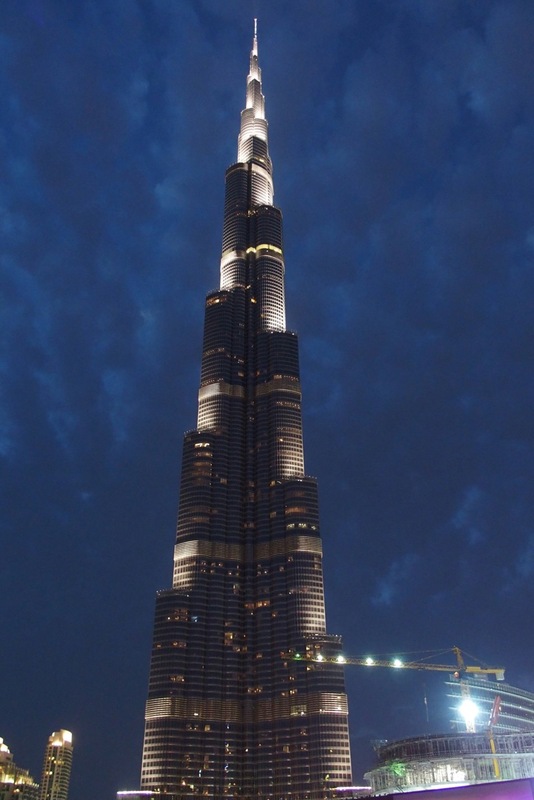 It is the tallest building in the world, 2,716.5 feet tall. (That extra half foot may be important someday if another country tries to challenge the record.) By the way, that’s more than half a mile! Some call it a giant toothpick. In any other spot, the “dwarves” next to the Burj Khalifa would be wondrous skyscrapers by themselves. The 148th floor has an observation deck, the world’s highest outdoor observation deck, fittingly called SKY. The New Year’s Eve fireworks and lights show is pretty spectacular. It really is difficult to get the whole Burj Khalifa in one photo. Adjacent to the tower is the Dubai Mall, the world’s largest shopping and entertainment center. According to its website, the Dubai Mall the largest collection of fashion brands under one roof anywhere in the world and is set to become the next fashion capital of the world. 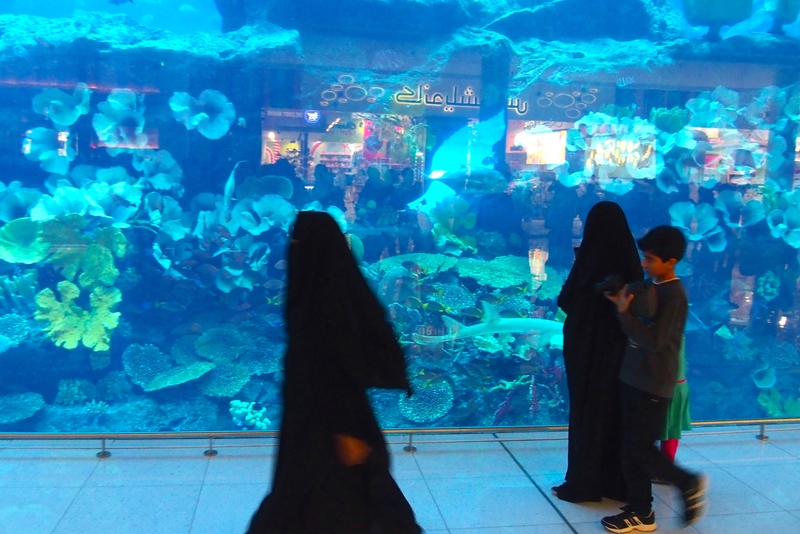 It has over 1,200 stores, an ice rink, and the Dubai Aquarium. We wondered what the fish thought of the ladies in black. Ground level in front of the building is just as impressive as the skyscraper. If you’ve seen the Bellagio in Las Vegas, this multimedia fountain in Burj Khalifa Lake may look familiar; it’s by the same designer. Only in Dubai, the fountain is much bigger, 900 feet long. Here, the Dubai Fountain shoots water up to 500 feet. The lighted sprays dance to music. Unlike the Great Wall of China, this fountain is visible from space, or at least it is claimed to be. It is the brightest spot in the Middle East, possibly the world. Play the video to watch the fountain dance to the music. 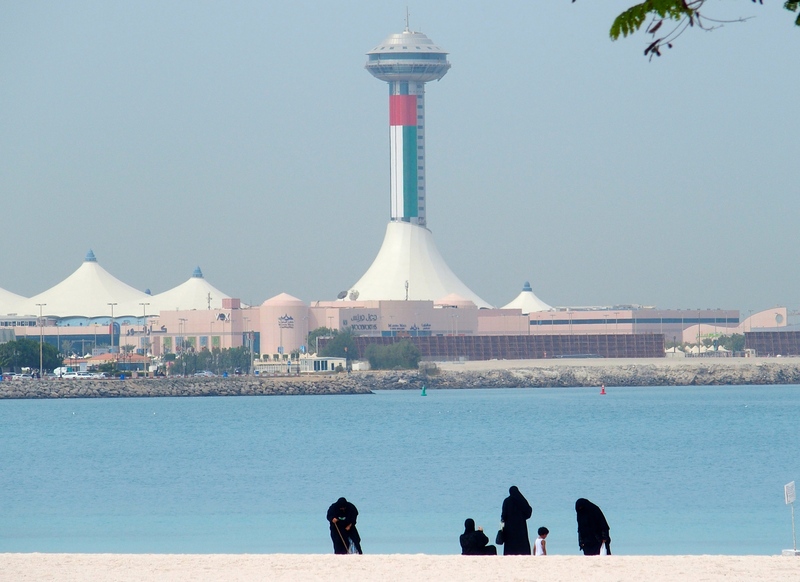 Our first stop in Abu Dhabi was the Corniche area along a lagoon off the Persian Gulf, with white-sand beaches and turquoise water. Much of the nearby area is built on reclaimed land. You must pay to enter many of the beaches here, and of course follow rules for appropriate swimwear. Men swim in typical Western-style swim trunks (not Speedos) while women are covered top of the head to toe in heavy black cloaks. Not to good for tanning. Nancy’s seatmate from Sydney to Abu Dhabi was a woman in full black, rather heavy cloak, her hair covered, but her face exposed. She actually was wearing two layers of black and put on a third, an abaya, before we got off the plane. She added a black veil and black gloves. The veil was somewhat transparent so she could see lights and shapes looking out, but we could see nothing looking in. This one had no slits for the eyes. She explained that she has worn these garments her whole married life. Even though her husband passed away years ago, she simply would not feel comfortable in public without them. She has three kids who are practicing medicine around the world, probably not in abayas! 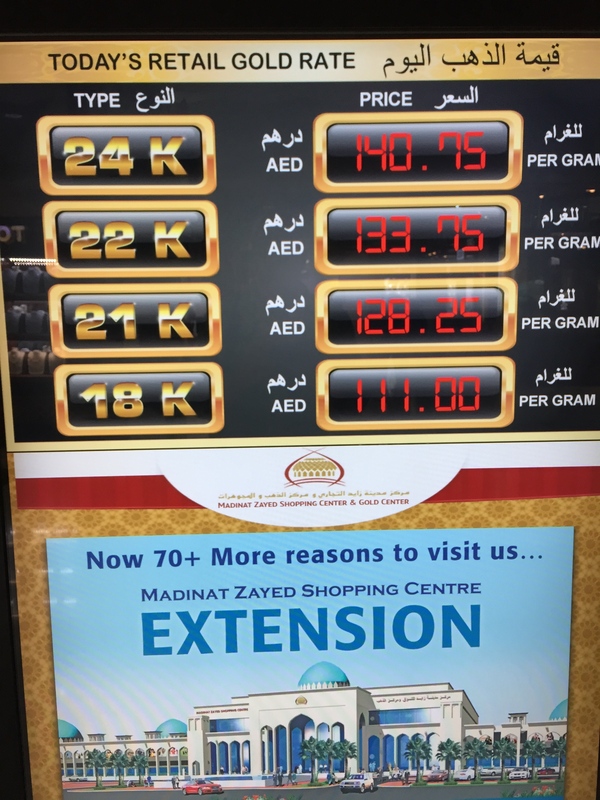 She pulled out a small pouch filled with beautiful gold jewelry and gave us some good advice for visiting Abu Dhabi at this time: “Gold is cheap!” Her daughter, a perky recent high school graduate, sat next to her wearing a striped polo shirt and jeans. 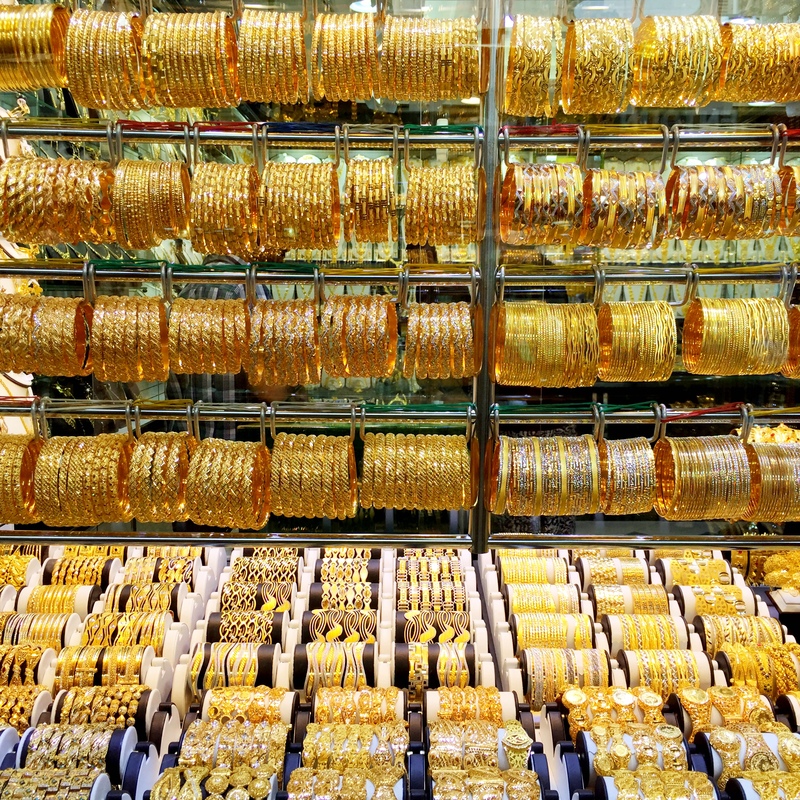 Following her advice, we spent some time in a gold souk. These are not shiny baubles that turn your wrists green or flake off a thin veneer. 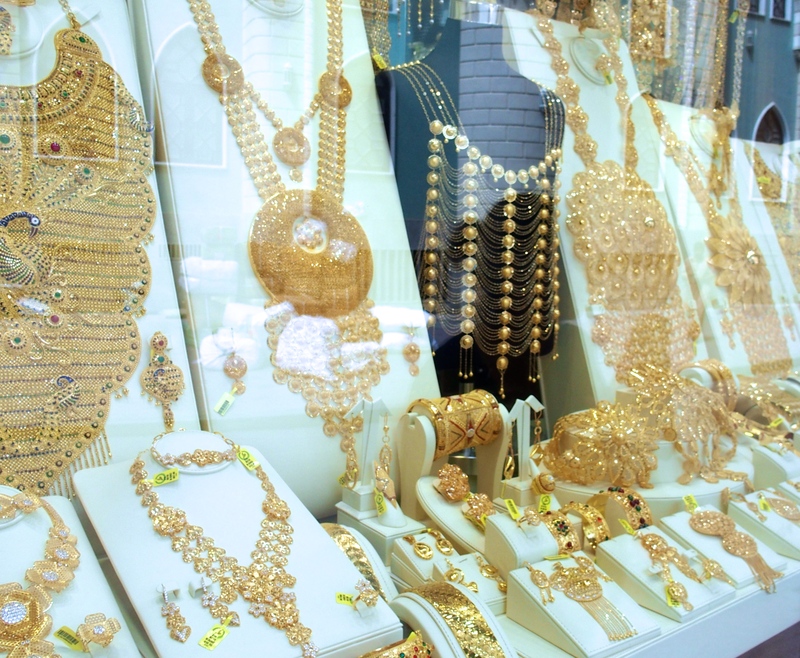 The gold is 18 to 24 carat and is sold by weight with that day’s price. Translated to units we’re accustomed to, that’s 850 to 1,070 USD per ounce, a steal! In many shops, even the more decorative pieces were still sold by weight, despite the extensive beautiful workmanship involved. These were not quite ornate enough for my style. 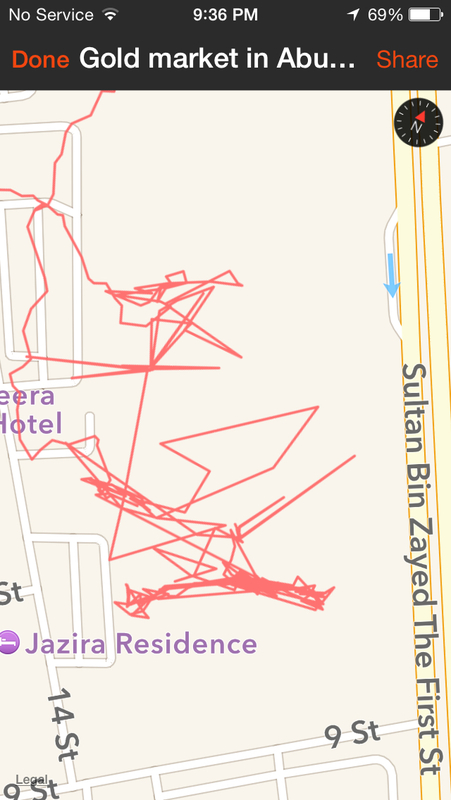 Strava documents our fruitless hunt for gold! The highlight of any trip to Abu Dhabi, and maybe to U.A.E. in total, is the Sheikh Zayed Grand Mosque. This is the largest mosque in the world. Note that U.A.E. seems to be trying to have all the biggest and brightest of everything. They do, after all, have a lot of oil money to spend. The mosque is so “-est” that it gets its own post. This entry was posted in Stravaficionados, Travel Journal and tagged Abu Dhabi, Burj Khalifa, Corniche, Dubai, Dubai Fountain, gold, U.A.E.. Bookmark the permalink.